The Mad Cow Mundihunt line of meat processing knives were designed by Mad Cow Cutlery based on years of input from butchers and hunters, and manufactured by Mundial one of the world's leading commercial knife manufacturers and one of the top selling US commercial cutlery brands. Everything about this series was designed and constructed for commercial use and abuse, while combining features that hunters and home butchers prefer. The blade is constructed of high-carbon stainless steel, specially formulated by Mundial to offer a long edge life, without being too hard to prevent resharpening. The edge features a popular commercial meat processing grind, that involves a slightly higher grind and an extra polished edge, creating an blade that will provide better cutting on hide, and tough carcasses or meat. The handle was designed by Mad Cow Cutlery to be both functional for commercial use, but provide extra grip, control and comfort. Blaze Orange color was chosen to make the knife highly visible, and meet government safety color requirements. 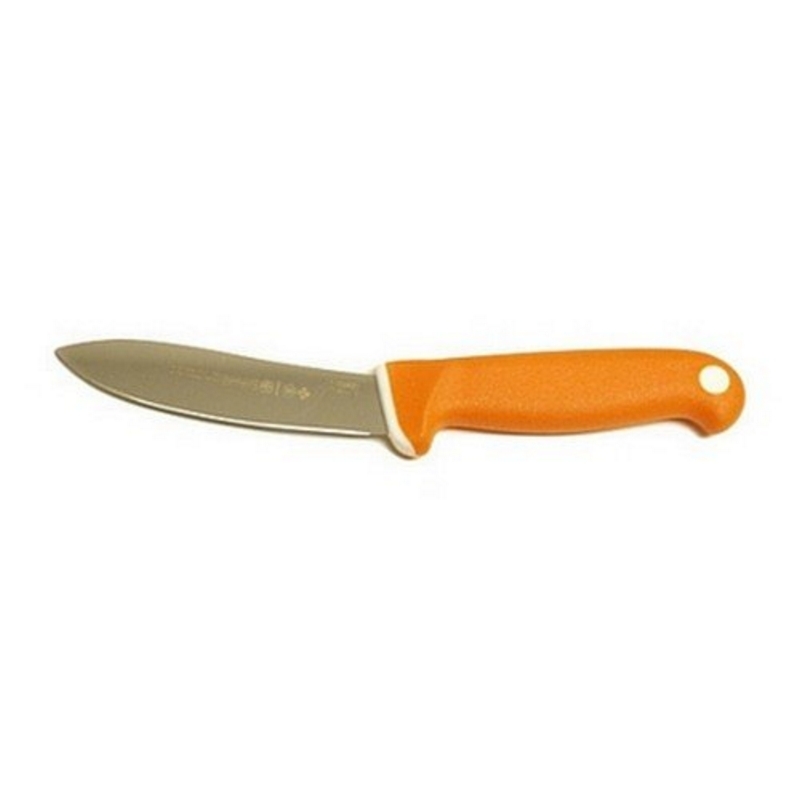 The handle is made using a dual injection molded on process, that forms the handle under pressure around the tang and portion of the handle to create an extremely strong, and tough grip, forming a seamless connection with the blade. The first layer, or inner polymer layer is constructed of dense commercial grade polymer that forms a tight bond with the blade. The second, or outer layer is constructed of a temperature resistant rubber like textured polymer that forms seamlessly with the inner layer, but provides a softer and extremely anti-slip grip. For added protection Sanitized® brand antimicrobial agents were added to the polymer mix to help reduce bacteria growth and odors. To help identify each knife, a unique tracking number is stamped on the blade - so no more having to find a different color handle from your coworkers or hunting buddies, or cutting a notch in the grip. The Mundihunt line is NSF® certified, meaning it meets all food industry standards for sanitation, and all knives come with a Lifetime Guarantee against defects.